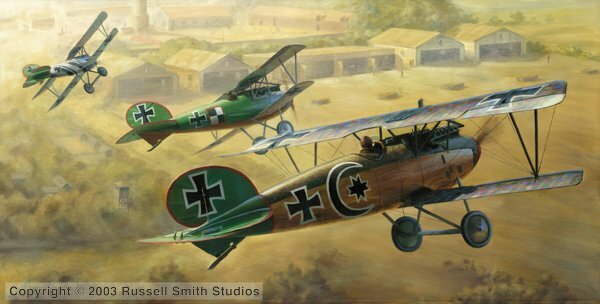 Among the German Jastas, one of the highest scoring was Jasta 5, with over 250 victories to its credit. Three of its most notable pilots – Ltn d R Fritz Rumey, Ltn d R Josef Mai and Ltn d R Otto Könnecke – gained such a notable reputation that they acquired the nickname “The Golden Triumvirate.” Between them, these three non-commissioned officers scored 110 victories by the war’s end. Like all other German Jastas, Jasta 5 was based at several different aerodromes during the war. However, the unit is usually associated with with the Boistrancourt aerodrome, shown here. Boistrancourt was notable in that it was one of the only German Aerodromes to have hard, fixed hangars rather than the canvas tent hangars which were normally utilized. Behind the aerodrome was a chateau and a sugar refinery which added to its distinctive look. Pictured from front to back are: Ltn d R Josef Mai, 30 victories; Ltn d R Otto Könnecke, 35 victories; Ltn d R Fritz Rumey, 45 victories.